The ‘CPU’ is one of the most power consuming hardware of a computer. Although CPUs come with built-in, automated & on-demand power saving features (such as shutting down certain ‘regions’ & cores, or reducing the overall clock speed), there are software tools that can be used to overwrite these automated settings for saving more power. One such tool that is available for Ubuntu users is called ‘indicator-cpufreq’ that once configured correctly can easily save a lot of power, at the expense of reduced performance, like under any other similar utility, of course. It is a small and a simple tool that once installed resides on the ‘system tray’ area, and you can use it to switch between the available CPU speeds (speed listed there will differ according to your CPU model), or you can use one of the built-in presets (Conservative, Ondemand, Powersave & Performance) as well. 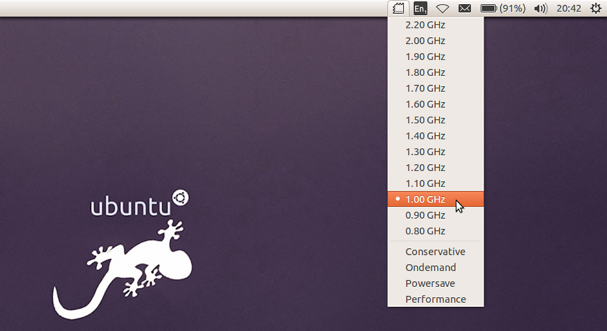 To install ‘indicator-cpufreq’ on Ubuntu 13.10, open your Terminal window and enter the below command. After the installation finishes, logout from the desktop and re-login, and you should now see it running on the top panel’s ‘System Indicator’ area. For whatever reason, if you wanted to get rid of it, then use the below command. Again, logout and re-login for the changes to take place.